A look back at #SMWGla…. Social Media Week happens to be over one month ago. We have already discussed our event twice now and felt it time to pay tribute to some of the other great events that happened that week in the city of Glasgow. Firstly, it must be said that Glasgow well and truly stepped up to the mark for Social Media Week. With over 130+ events in the city and people chipping in to assist with venues, catering, speakers etc, all in one week alone. It was fantastic to be a part of it. Well everybody in the city knows ‘Business Banter,’ one of Glasgow’s most loved networking events. A large part of the Banter’s success was due to the LinkedIN group and Twitter where the hash-tag #TDBB dominates the Twitter-waves every Thursday morning. For Social Media Week, a one-off banter would not suffice. Jacky of ‘Think Different Events’ pulled off a massive operation. Not only holding five daily banters with a revised format but also arranging for five speakers at each and having them filmed at the same time and published online. No small feat. Truly getting into the spirit of social media by allowing the content to be shared; something that was appreciated by many. I personally had the pleasure of talking about ‘social branding’ on the Thursday morning and can say that I thoroughly enjoyed speaking at the event as well as listening to the other presentations. After enthusing about the banter for a quite a few months, my sister, who lives in London, who was with me on the Thursday morning commented that the banter was her ‘favourite event of the week.’ All in all, a massive tribute to Jackie for pulling it off. He was even able to organise separate organisers on the two days he wasn’t present. Its this attitude and dedication to the greater good that makes the Banter so universally popular with businesses in Glasgow and puts the ‘social’ into social media. Of course, any wine tasting event in the city of Glasgow was always likely to be well received. But #SMWine held at the West brewery was an absolutely great event. It was engaging, good fun and international too. The event was hosted and communicated live via Skype by wine expert Pieter Rosenthal. Making this a true international social media event. We tried a multitude of great wines which were all tasted whilst being told about their various stories by Pieter. Now my mind may be a little hazy here, but if I remember right, they included three whites, three reds and champagne. The favourite being an Argentinian white from Argentina called Trivento. One of my absolute favourite events of the week came from one of our very own clients. Raschique Narwan of fashion brand Freak Dem. Her T-Shirt Freak Out was quite simply magnificent. A two part event with the second part hosted at the Lighthouse, it included design, music and comedy all of the highest order. Part one of the event was to conduct a competition for a t-shirt design, where designers were invited to contribute their designs. Social Media would be used to gauge opinion and feedback. On the Friday evening, the very last event of the week, the results of the t-shirt competitions were announced in an excellent show that included a powerful speech by Raschique herself about the urban society she wants to build with Freak Dem as well as wonderful singing from Amore Kai, Mo Sharif and the hilarious comedy of Sean Reid. A wonderful way to finish the week. After a number of seminars, formal presentations and the like from the business community; it was really great to kick back, listen to some great music and have a few laughs at the T-Shirt Freak Out. Well done Freak Dem!! 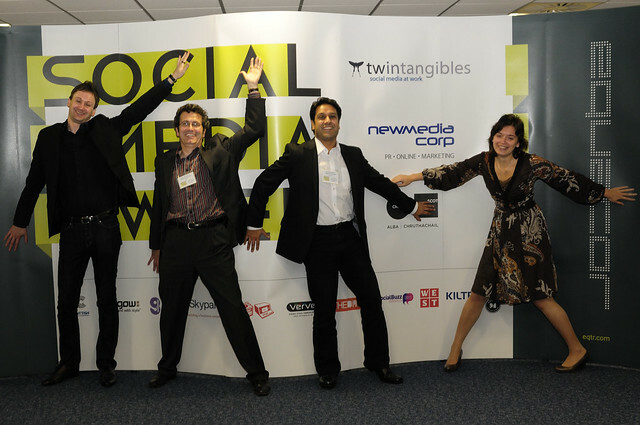 Whilst discussing Social Media Week, I must close by congratulating my good friends Tim and Daniela of Twintangibles. Twintangibles along with New Media Corp, were the event organisers and put their heart and soul in making the week what it was. They absolutely ensured that the events remained true to the principles of social media and were absolutely tireless in their efforts in what was an incredibly large, and at times, complex operation. It was their vision, desire and ability to inspire that made Social Media Week, what it was in Glasgow. The capturing of a man like Don Tapscott was symbolic of the herculean effort they made. And no less than they deserved. For people that truly want to embrace the true spirit and potential of social media, I suggest that you check out their website at http://twintangibles.co.uk/ In the picture above, Tim and Daniela are second and fourth from the left where they are joined by Danny Gray of Google on the left and Arvind Salwan of New Media Corp who also deserves a huge thank you for his great work. Massive congratulations and thank you to all of you!